Hit the ball straighter and longer with strong forearm muscles. Golfing is a sport that requires the cooperation of the entire body. From the feet through the legs, hips, shoulders, arms and hands, there is virtually no muscle group left undisturbed. The forearm and wrist area are used during the golf swing to control the club through vital impact, creating solid ball striking, club head speed and release in the follow through. One of the ways you can work your forearms and wrists is a little exercise known as club bobbing. Club bobbing is quite simple, and all you need is a 7-iron. To do a club bob, hold the 7-iron in your hand, club head down towards the ground, and swing the club slowly back and forth. You should feel the muscles in your wrist and forearm work to move the club. Do this 10 times in one hand and then switch over to the other. Because the exercise is fairly low stress, club bobbing can be done during slow times at work, at home or on the course before you tee off. The lightning rod is another exercise that can be done just about anywhere and helps to build and maintain strong and flexible forearm muscles. Once again, you'll want an iron (a 7-iron will do). 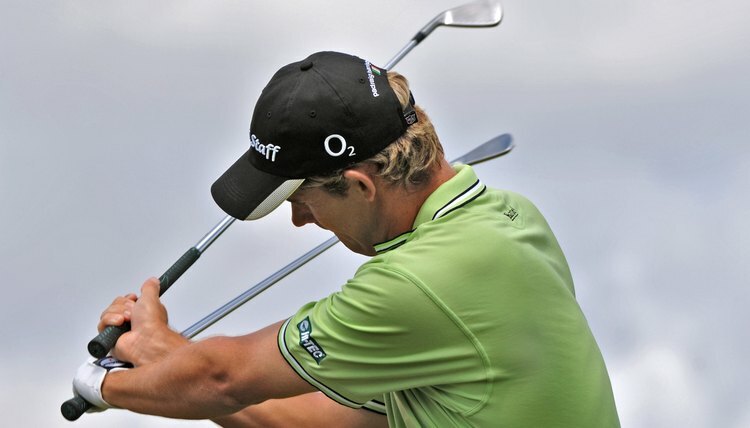 Grip the club in your hand and stretch your arm out straight in front of you. Hold the club out and, bending the wrist, elevate the club 45 degrees. Bring it back down slowly and then repeat the movement. Do this 10 to 12 times and then switch arms. You should feel a slight burn in your forearm if you've never done this exercise before. Don't attempt this exercise when there is lightning about—there's a reason for the name. The wrist is an important gateway joint for building your forearms. Wrist rotations with a weighted club will help build both at the same time. If you don't have a golf club weight, you can purchase one at select golf retailers. Apply the weight to your iron right below the club head, bend the elbow and hold the club in the middle of the shaft. Tuck your elbow in to your side so that your upper arm stays tight on your body and your forearm is extended out in front of you. You can use your free hand to hold your upper arm tight. Turn the club in a counter-clockwise direction until the club is once again parallel to the ground, then bring it back to the start position. Do 15 rotations with one wrist and then switch over to do the other wrist.